Raita is a must have when having Hot Curry dishes! Combine all ingredients in small mixing bowl. 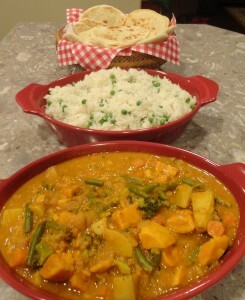 Refrigerate until ready to serve with Hot Curries. I used to make this quite often when I lived in Australia. Not sure where the recipe came from? If memory serves me correctly, it was a recipe card from Woolworth’s Grocery store. Very yummy rice dish! Add onion and saute for 3 mins, stirring often. Add zuchinni, carrot, red pepper, curry powder and cumin; stir. Add uncooked rice, stir to coat. Add vegetable broth, chick peas, dried apricots and raisins, stir, bring to a boil; reduce heat and simmer for 25 – 30 minutes, stirring occasionally. 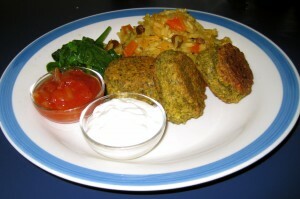 I served these with Falafel, Sauteed Spinach, Tomato Chutney and Tomato Raita. 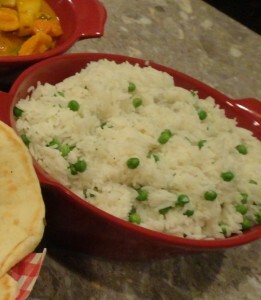 I love the rice we get when we go out for Indian so I have tried to make my own version at home. In medium size saucepan with tight fitting lid combine rice, water, turmeric, cumin, butter, salt and pepper. Bring to a boil; reduce heat, place lid on saucepan and cook for 15 minutes. Briefly remove lid, add frozen peas, replace lid and continue cooking for another 3 minutes. Remove from heat, fluff rice with fork. My husband was recently required to bring a Pot Luck dish to a belated Christmas work gathering. Initially I was thinking I would send along a Vegetarian Lasagne but then I saw the sign up sheet… Seems Luke’s workmates like Indian! The Sign Up sheet looked a bit Meat Heavy so I volunteered Lightly Spiced Indian Rice with Peas, Quick Curried Vegetables and Naan. Heat oli in large saucepan over medium-high heat. Add onion and cook for about 5 minutes, until lightly browned; stir frequently. Add coconut milk,water and vegetable stock cube. Whisk in tomato paste, curry powder, cumin, turmeric and chili flakes. Add sweet potato, potato; reduce heat to medium, cover and cook for 15 minutes or until potatoes are still firm but almost done. Remove from heat and stir in frozen green peas, cilantro and lime juice. 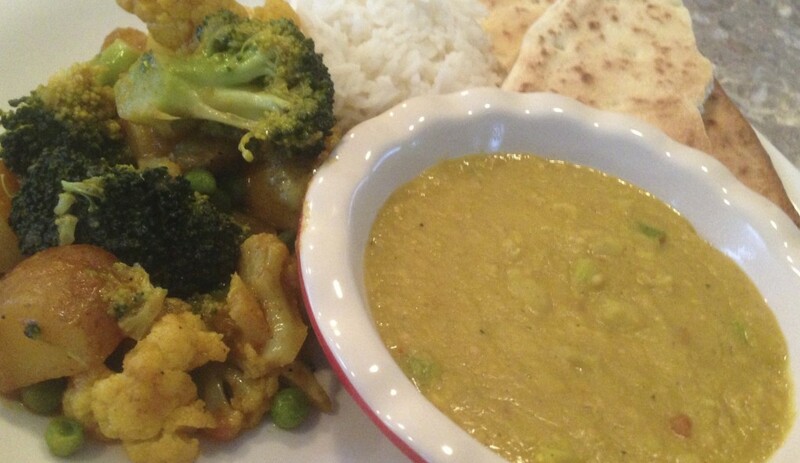 Serve with steamed Basmati Rice or Naan. Add coconut milk, water and vegetable stock cube; whisk in tomato paste and curry powder. Bring to a boil; add potatoes, reduce heat to medium, cover and cook for 15 minutes until potatoes are stiff firm but almost done. Stir in cauliflower, broccoli; cover and cook another 5 minutes, or until vegetables are tender. Remove from heat; stir in frozen peas, cilantro and lime juice. 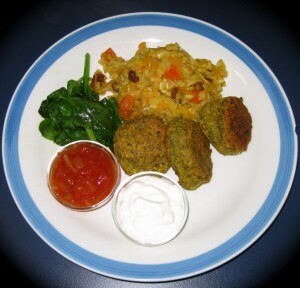 Serve with Basmati Brown Rice.